Crafting can be fun and when you enjoy it, you have hard time stopping. You craft on and on and some people view recycled crafts as not something they can practically utilize in their homes or offices. That is not true. There are many great ideas for highly usable recycled items, which help you to make your house more comfortable and solve some household problems. Take a look at the list of 25 ways to use unique recycled items in your home. Just click on the links to see more photos and tutorials. You may buy recycled crafted items from my Etsy shop recycledcrafting. 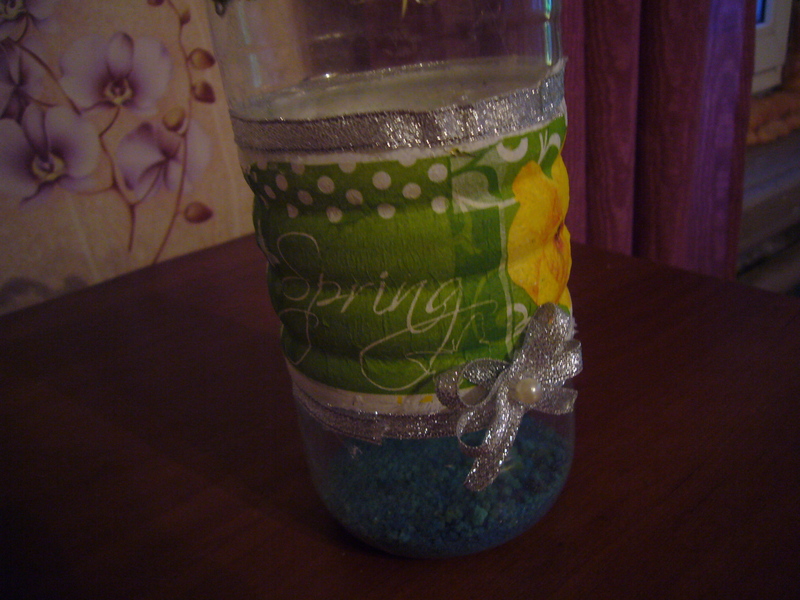 You may store your cooking oil in a recycled glass bottle decorated with decoupage. The good thing is that you may pick any design you want! Plus, once a bottle gets messy (they do get messy after a time, as you store oil there), you can easily restore it by decoupaging all over again. I used to have a small but very annoying problem at my house: we used to scatter match boxes all over the kitchen and even in the yard. Then you need a match to light the stove and you run around looking for a match box. 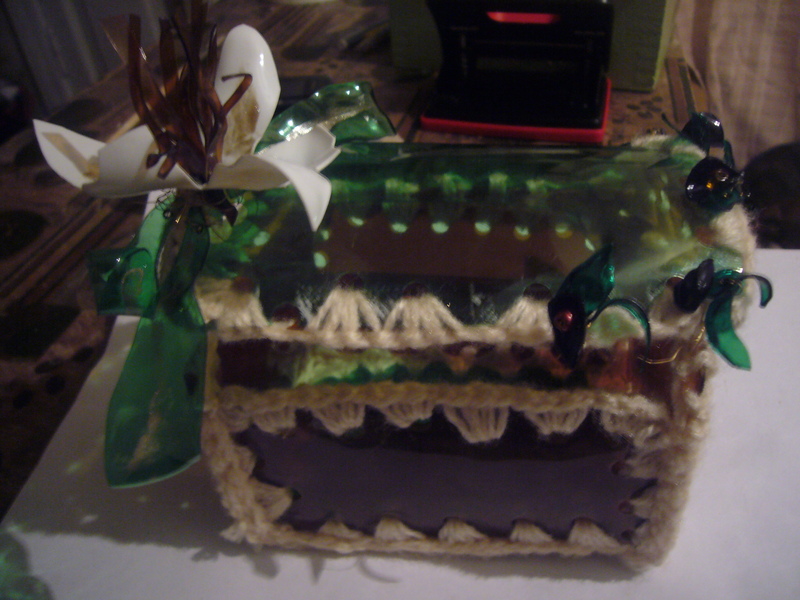 So, I crafted a recycled plastic bottle box for storing matches. Now we have them all in one place. I have several different crocheting hooks and needles. So, I made this cute looking recycled basket to store them all in one place. It looks good and it is a very useful recycled item. I love spices. So, I decoupaged a cardboard box to store them all in one place. Again, this recycled craft item looks good and it is usable. 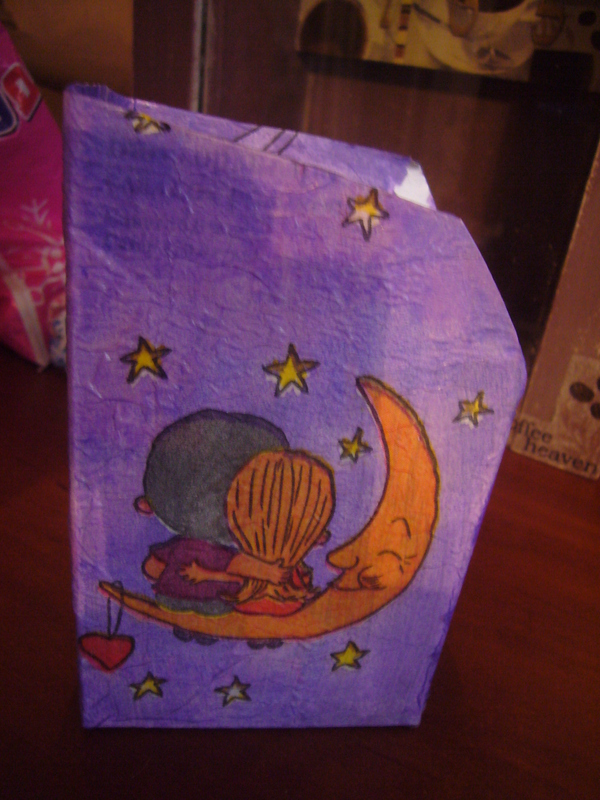 This is a papper mache art doll jewelry box. It looks nice and few people can guess what it is from the first sight. So, they ask me questions and I get to share about crafting and recycling. And, I store my jewelry there. I have this problem: I have many small crafting supplies and my kids tend to scatter them around the house. So, I use this small soda can recycled box to store my supplies. You can also use it as a jewelry box. 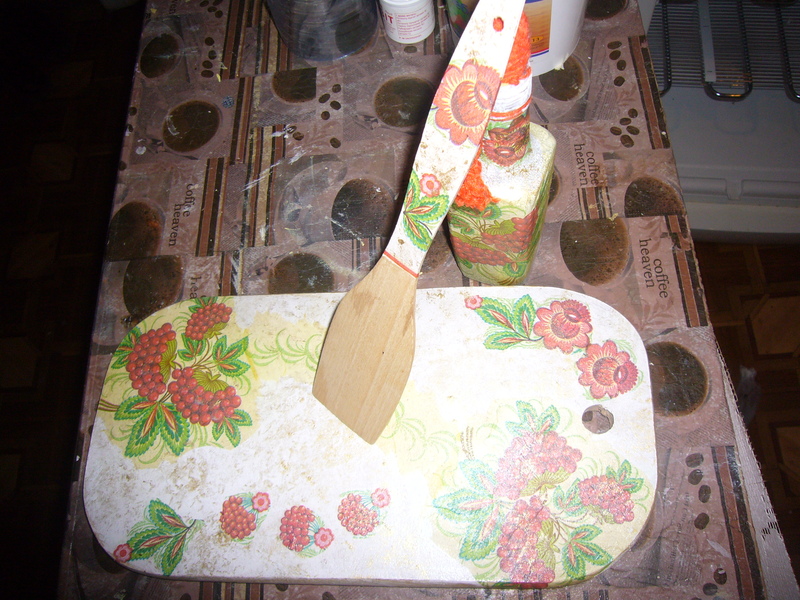 I have decoupaged a wooden cutting board from one side. I have been using it for a year now and it still looks good. Besides the polish protects it from water and heat, so sometimes I use it to set a hot teapot on. I have two girls and they have many hair ribbons and pins. They really love storing them in this cute little coconut and organic yarn recycled box. Kids grow up fast and you get lots of small clothes in your house. Some of them get small spots on them. I use crocheted baby clothes to make recycled pot holders. You just cut out any shape of a pot holder you want and then use your hook and yarn to crochet it over on the sides so the pot holder would look nice. This is an easy, fast and nice looking usable recycled craft project. I crocheted the top part of the water bottle and decoupaged the middle part. Now I use it for storing brushes in the bathroom. There are many other creative and useful recycled crafts you can find on the pages of my blog or on my Facebook pages. Click to my Etsy shop to get some handcrafted, recycled or vintage usable items for your home. 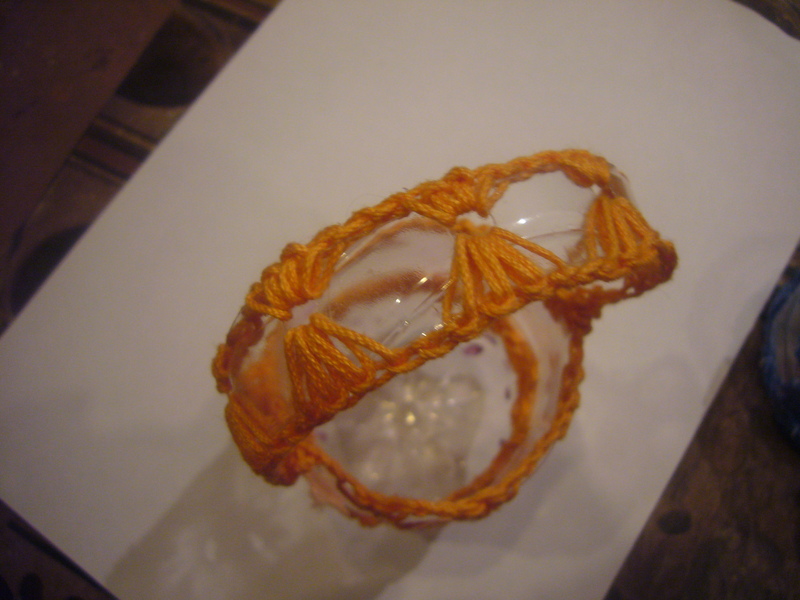 This entry was posted in Decoupage ideas, Go green, Uncategorized. Bookmark the permalink. 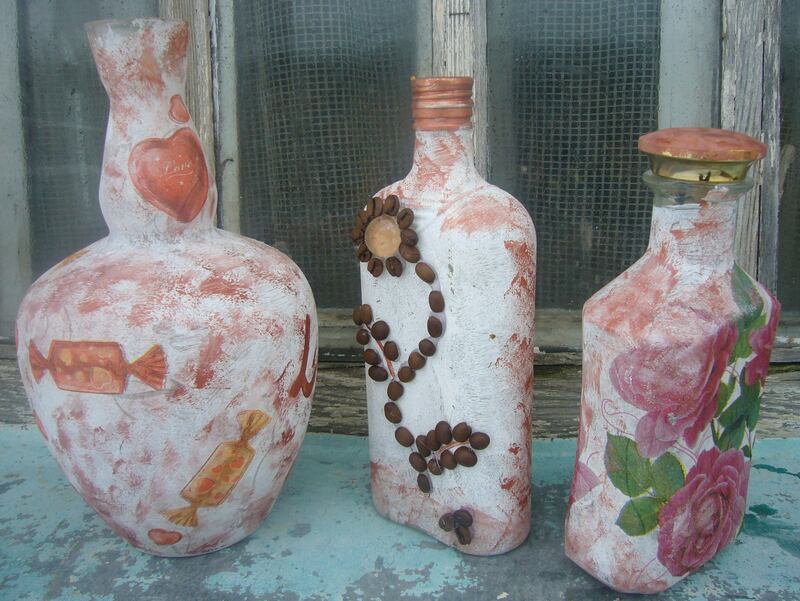 Very beautiful decoupaged glass bottles!